You think you’ve seen everything don’t you? Well you haven’t seen Euphoria!, Oddball Films’ contribution to the film section of Bay Area Now 5. Steve Parr belongs to a breed of auteur/archvist/artists like Rick Prelinger, Craig Baldwin, Janice Allen and of course St. Bruce Conner, that find the sublime in the strangest archival footage. I recommend this in the strongest possible terms. A great date movie, especially if your date is Squeaky Fromme. Oddball Films: Euphoria! at YBCA Sept. 25th. There have to be Broadway lights in the future for the cast, crew and Geyser!, a scintillating play by Kevin Killian and Wayne Smith, which premiered at Small Press Traffic Friday night. Killian and Smith have collaborated on their fourth piece, and the writing has attained a sophisticated level of zany humor, pathos, and well-timed, quizzically amusing observations. The playwrights’ usual elements of a beefcake leading man, has-been celebrities, and obscure societal cultures mixed with a white bread American sensibility lead to a comfort zone in which favorite theatrical gambits like verbal cues in advance of stage action, writing that seems to occasionally surprise the actors, and malfunctioning technical effects create a frisson of ludicrousness. With a cast of mostly artists performing the roles, there were stretches of surprisingly good acting punctuated by occasional bad delivery and uninflected lines, scripts in hand. The play begins as the new fans created by the release of the DVD of an old TV series “Geyser!” set in the small town come for a meeting of the dweebie worldwide fan club. Wayne Smith himself played the butler with extremely funny white hair (I won’t tell you if he did it,) producing a character so nuanced one is amazed that Smith considers himself a visual and sound artist first and foremost. And then there were clowns… who called in the clowns? Simultaneously valorizing and taking the piss out of artists and/or the counterculture, the playwrights created a radical clown collective living on the outskirts of town that stole the show. As a comedian, Cliff Hengst (Bobo) is congenitally incapable of anything less than commanding the action and eliciting unrestrained laughter from an audience. 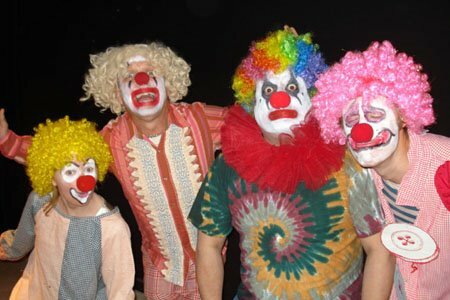 Pushing the envelope on the clown code of ethics, the clowns provide a safety valve for the existence of those in Geyser who don’t quite fit into the standard social scene, while maintaining a close connection with those in power. Every cast member sensitively performed a role with funny lines well tailored for them: Karla Milosevich as Kitty Potter, host of “Kitty Corner”, Rex Ray as Rick Penny, host of “Rick Penny Among the Many”, Wayne Smith as Crimmins, the butler of a great star, Kevin Killian as Marjorie Cantrell, first lady of the American theater, Gerald Corbin as Maurice Anton, Celebrity Stylist, Craig Goodman as Jared Oriole of Sherman Oaks, Tanya Hollis as Anouk, Jared’s fiancée from Brittany, Mac McGinnes, as Wilford Hall, town clerk, Jocelyn Saidenberg as Klanglar Gunnarsdottir, from Iceland, Laurie Reid as Mayor Constance Strode, Colter Jacobsen as Charlie Strode, the mayor’s son, now a clown known as “Buttons”, Glen Helfand as Michael Carson, a local fan and owner of a bed & breakfast place, David Brazil as Lindsay Wagner, a dangerously deluded fan, Margaret Tedesco as Donna Mangiafranni, a fan from Florida, Stephen Boyer as Teddy French, life partner of Michael Carson, Suzanne Stein as Molly Martin, a Twin Cities fan, Taylor Brady as Gypsy Kincaide, a truck driving fan, Cliff Hengst as Bobo the clown leader, Anne McGuire, as the clown Buttercup, and Scott Hewicker as Dennis Quaid. Big fun this evening at SFMOMA as thirty finalists in Tony Labat’s I Want You Live Art competition each took stage to deliver their one-minute performance/monologue “I Want You” demand. Look for the five winners, selected tonight by audience ballot, in posters around the city as the presidential election nears and in Labat’s new video project I Want You at SFMOMA this November. San Francisco’s Yerba Buena Center for the Arts (YBCA) has chosen a new curator of visual art, Betti-Sue Hertz. Hertz comes to YBCA from a position as curator of contemporary art at the San Diego Museum of Art (SDMA). At SDMA Hertz was responsible for a range of exhibitions including Animated Painting (2007), Past in Reverse: Contemporary Art of East Asia (2004) and Axis Mexico: Common Objects and Cosmopolitan Actions (2002). Before relocating to San Diego, Hertz was a curator and arts activist in New York for more than 15 years. As director of Longwood Arts Project from 1992 to 1998 she organized numerous gallery and outdoor sculpture exhibitions. She codirected 1990s Art from Cuba: A National Residency and Exhibition Program, a cultural exchange project for five artists in five American cities (1997-99). For the Bronx Museum of the Arts, New York, she curated Beyond the Borders: Art by Recent Immigrants (1994) and co-curated (with Lydia Yee) Urban Mythologies: The Bronx Represented Since the 1960s (1999).